The Laugh & Learn Learning Keys are baby's first set of learning keys. The keys are the perfect size for baby and feature realistic detail and tactile elements. 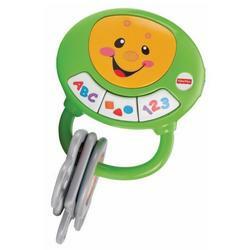 Baby can unlock learning and music fun! The keys feature 3 learning icons on the face Letters, Shapes and Colors and Numbers. When baby presses the buttons, the face with light up and dance to fun sing-along songs, music and phrases.